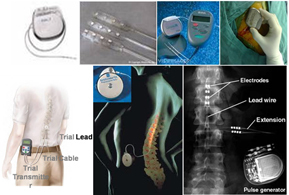 A.Spinal Cord Stimulator Implantation(Pacemaker for spinal cord)/ Sacral & Peripheral Nerve stimulation are used to treat chronic pain associated with the following conditions, approved by FDA. Chronic intractable back pain due to past spine surgeries called Failed back surgery syndrome with epidural fibrosis, post laminectomy pain, arachoiditis; Complex regional pain syndrome or Causalgia; vascular / ischemic pain in limbs; Chronic Pelvic Pain, Occipital neuralgia etc. 50,000 spinal cord stimulators are implanted annually worldwide. Sacral & peripheral stimulators are popular now and figures not available. Hospital stay is longer and cost is more compared to major neurosurgical procedures. Cost of implant is additional 5-8 lacs. Much cheaper than US and Europe for same procedure. Indications-treatment of severe chronic/ intractable pain / cancer & non cancer pain, failing to other pain treatments or where pain medication requirement is too high & causing serious / intolerable side effects. Cost of treatment is similar to Spinal Cord Stimulation but cost of implant is slightly less. For Trigeminal Neuralgia, Facet syndrome, Sympathetic neurolysis for vascular pain etc are routine procedures. Spinal Cord Stimulator Implantation (Pacemaker for spinal cord) / Sacral & Peripheral Nerve stimulation are used to treat chronic pain associated with the following conditions, approved by FDA. Spinal Cord Stimulation (SCS), an implantable medical device, is very effective in treating chronic pain that is due to nerve damage or neuropathy. After inserting special, “leads” into the epidural space, trial stimulation from external generator is performed for 5-7 days. If successful, permanent pacemaker like device is implanted in the body, which converts painful message to a pleasant sensation called neuromodulation. No drug is used in this technique and patient can regulate stimulation through a cordless remote control device. Peripheral nerve stimulation is a technique in which an electrode is surgically placed adjacent to a peripheral nerve. A weak electrical current then inhibits the transmission of painful impulses with that nerve, relieving pain within the sensory distribution of that nerve. Used in pain syndromes that are not amenable to conservative treatment, including nerve blocks e.g. post-thoracotomy intractable intercostal neuralgia. Intrathecal Drug Delivery - (implantable programmable pain pump) uses a small implanted programmable to deliver pain medication directly to the intrathecal space,via a surgically implanted infusion pump and catheter. 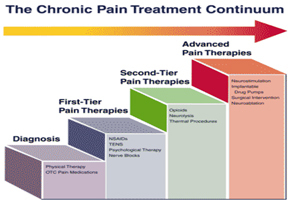 Very effective in treating intractable chronic and cancer pain. After a trial procedure, a catheter is placed in the intrathecal space and then connected to a pump that has a reservoir that holds very concentrated medication. Refill for medication is needed approximately 6 months. Small amounts of medication (1/300th of oral dose) is needed, hence no or minimal side effect. Patient can control dosage through a remote control. Indications- severe chronic/ intractable pain / cancer & non cancer pain, failing to other pain treatments or where pain medication requirement is too high & causing serious / intolerable side effects. A small implanted programmable pump can relieve long-term pain by using small amounts of medication delivered to intrathecal compartment1/300th of oral medication is required. After a trial procedure, a catheter is placed in the intrathecal space of the spine and then connected to a pump that has a reservoir that holds very concentrated medication. This pump comes in various sizes and dosing technologies. Used to treat fracture of vertebra(Spine) due to osteoporosis or cancer metastasis. 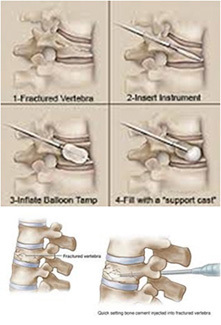 Bone cement is injected into the diseased vertebra and normal shape is achieved. Performed under local anaesthesia as a daycare procedure. Much safer than traditional major surgery, in these elderly patients who generally have many associated medical conditions. 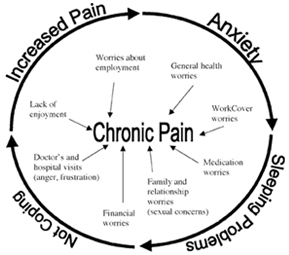 Chronic pain is the pain that lasts more than 3-4 months and unresponsive to conservative treatment. Treating pain promptly can prevent it from turning into hard-to-treat chronic pain. Chronic pain leads to suffering, sleep deprivation, social isolation, depression, and other problems that can affect your relationships at home and at work. When pain lasts beyond healing, errant nerve impulses keep alerting the brain about tissue damage that no longer exists. The warning system itself fails. The pain is no longer a function of a healthy nervous system and becomes a disease itself. Common Pain conditions and treatment modalities. Interventional Pain Management targets the pain generators or the source of pain by delivering medications to treat the pathology, like anti-inflammatory agents or numbing / altering the pain sensation / destroying the abnormal pain pathways. These are usually performed when drug therapy is not effective or produce major side effect. Diagnostic block is performed with local anaesthetic to confirm the divisions involved. 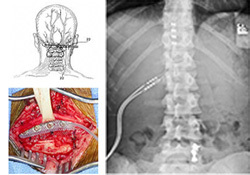 Long term relief is provided with Radiofrequency Rhizotomy of the affected divisions. This is performed in the operating theatre using fluroscopy and Radiofrequency generator. Headache is in the back of head and may be on one or both sides. There has been great success with peripheral nerve stimulator, where electrodes are places under the skin, near affected Occipital nerve and stimulated with an external generator for 5-7 days for trial. If successful the generator is implanted in the body like a pacemaker. When Migraine headache is not controlled with medications, the best option is Botox injection. Low backache is one most common pain condition today. Most back pain resolve with painkillers, rest, physiotherapy and correction of posture. However, painkillers should not be taken frequently as it may cause more damage to your body than the cause of your pain. 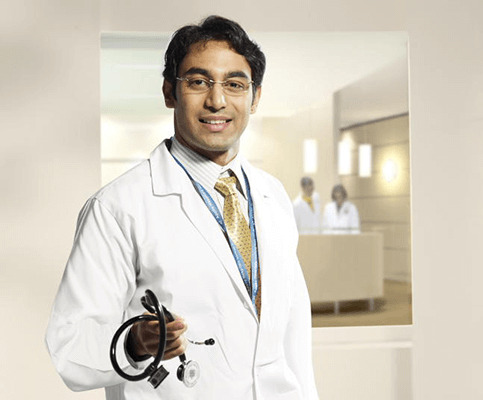 If pain doesn't resolve in 3-6 weeks like, you will need thorough physical examination and may be few investigations. 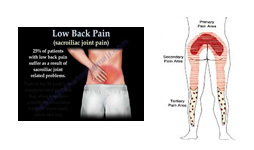 Common causes of backache are muscular, facet joint arthropathy, Sacroiliac joint arthropathy. 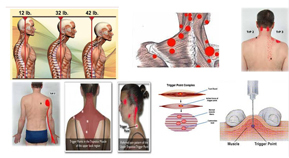 Muscular / myofascial pain is usually due to wrong sitting/ walking / standing posture; which causes muscle strain, leading to thickening of muscles called Trigger points. These are felt as nodules/bands and are painful with deep pressure and pain can be felt far away too. Medications taken by mouth,do not reach these hard fibrous trigger points because of poor blood supply and need to be injected directly. Muscular / myofascial pain is usually due to wrong sitting/ walking / standing posture; which causes muscle strain, leading to thickening of muscles called Trigger points. These are felt as nodules/bands and are painful with deep pressure and pain can be felt far away too. Medications taken by mouth, do not reach these hard fibrous trigger points because of poor blood supply and need to be injected directly. Facet joint are two small joints which connects vertebrae above and below and responsible for movement of spine. When these joints are effected, it causes back pain on movement and tenderness to feel. These joints are located under image intensifier / fluroscopy ( continuous X- ray)and injected with local anaesthetic to confirm diagnosis. These joints may sometimes have degenerated to an extent that they can't be pierced, in which case the nerve supply to the joint( Median branch to facet joint) is numbed. Once diagnosis is confirmed, these small nerves can be destroyed with Radiofrequency lesioning. These are safe procedures, performed under local anaesthesia and do not involve surgical cutting. Sacroiliac (SI) joints are formed by the connection of the sacrum and iliac bones. The sacrum is the triangular-shaped bone in the lower portion of the spine, below the lumbar spine. While most of the bones (vertebrae) of the spine are mobile, the sacrum is made up of five vertebrae that are fused together and do not move. The iliac bones are the two large bones that make up the pelvis. As a result, the SI joints connect the spine to the pelvis. The sacrum and the iliac bones (ileum) are held together by a collection of strong ligaments. There is relatively little motion at the SI joints. There are normally less than 4 degrees of rotation and 2 mm of translation at these joints. Most of the motion in the area of the pelvis occurs either at the hips or the lumbar spine. These joints do need to support the entire weight of the upper body when we are erect, which places a large amount of stress across them. This can lead to wearing of the cartilage of the SI joints and arthritis and an important cause of low back and leg pain. Patients often experience pain in the lower back or the back of the hips. Pain may also be present in the groin and thighs. The pain is typically worse with standing and walking and improved when lying down. Inflammation and arthritis in the SI joint can also cause stiffness and a burning sensation in the pelvis. Anti-inflammatory medications and Ultrasonic over the joints are usually helpful. Those who do not respond to conservative treatment, will benefit from injection of anti-inflammatory medications into the affected joints. Radiofrequency denervation of the joint is performed for lasting pain relief. The spinal discs are composed of a tough spongiform ring of cartilage ("annulus fibrosus") with a more malleable center ("nucleus pulposus"). The discs separate the vertebrae, thereby allowing room for the nerve roots to properly exit through the spaces between the vertebrae. The discs cushion the spine from compressive forces, but are weak to pressure applied during rotational movements. That is why a person who bends to one side, at a bad angle to pick something up, may more likely herniate a spinal disc than a person jumping from a ladder and landing on their feet. Sciatica is generally caused by irritation of of lumbar nerves L3, L4, or L5 or sacral nerves as a result of a spinal disc bulge or herniation. The nucleus pulposus, a jelly like substance, may extrude through the tear in the annulus and produce chemical inflammation reaction around exiting nerve roots. In a inflammatory response, local body chemicals like substance P & Prostaglandin E are produced and produce irritation and cause further compression of the nerve root in the confined space in the spinal canal. MRI/Nerve Conduction Velocity (NCV)/EMG/X-ray help to support diagnosis but clinical presentation clinches the diagnosis. In doubtful cases a diagnostic block with local anaesthetic is performed. A potent anti-inflammatory medication is deposited around the nerve, using fluroscopy and contrast guidance, under local anaesthesia, to reduce /treat inflammation and ease pain. The treatment is targeted at the source of pain, which is in this case is a tiny fraction of the whole body and rest of the body is spared. Orally taken medications circulate in the whole body and is responsible for many serious side effects likegastritis, kidney/ liver dysfunction etc. The procedures are called selective spinal root block/ transformational epidural, depending on where the drug is deposited in the path of affected spinal nerve root. They are performed as out-patient daycare procedures and are safe in the hands of experienced Interventional Pain Specialists. Theyare performed in the operating theatre under strict aseptic conditions and close monitoring. The main obvious function of the neck is to hold up the head. The neck is very fragile and it can move in all sorts of directions because of the sensory organs like the eyes, ears and nose. This is a disadvantage as the vertebrae can easily "disalign," or its joints can frequently get dislocated, due to whiplash, birth injuries, neck trauma, etc. Moreover, stress, posture, and excess computer use can stiffen the neck. Because of excessive mobility of the neck and wrong postures, the muscles holding the head are subjected to constant strain, leading to muscle spasm and later develop muscle knotting and bands. These itself cause pain on movement. When conservative treatment fails, these knots and bands in the muscles need direct treatment with trigger point injection. A trigger point is defined as a hyperirritable area located in a palpable, taut band / nodule of muscle fibers. Cervical radiculopathy is a neurologic condition characterized by objective signs of loss of neurologic function, that is, some combination of sensory loss, motor loss, or impaired reflexes, in a segmental distribution. 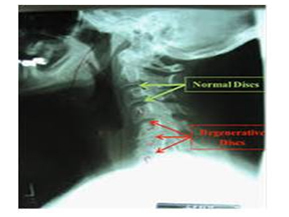 Caused by inflammation of the cervical nerve roots, following disc protrusions, because inflammatory exudates have now been isolated from cervical disk material. 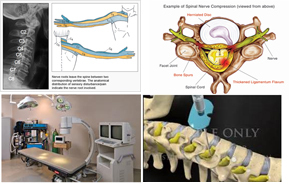 Selective spinal root block is performed under fluroscopy and anti inflammatory medication is delivered at the source of nerve pressure and irritation. 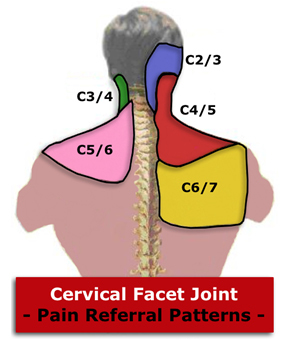 Over 50% of patients presenting to pain clinic with neck pain have the cervical facet joints as the source of pain. Pain from the cervical facet joints tends to follow relatively constant and recognizable segments patterns. Radiofrequency (RF) treatment of the medial branch, supplying the facet joint, is treatment of choice, after confirmation with diagnostic block. Cervical spondylosis is a condition involving changes to the bones, discs, and joints of the neck. These changes are caused by the normal wear-and-tear of aging. With age, the discs of the cervical spine gradually break down, lose fluid, and become stiffer. Cervical spondylosis usually occurs in middle-aged and elderly people. The symptoms of cervical spondylosis include: Neck stiffness and pain, Headache that may originate in the neck, Pain in the shoulder or arms, Inability to fully turn the head or bend the neck, sometimes interfering with driving, Grinding noise or sensation when the neck is turned. Cervical vertigo is the term used for dizziness associated with cervical spondylosis. Position receptors located in the facets of the cervical spine are important in the coordination of head and neck movements and cervical proprioceptive dysfuntion is a common cause of vertigo triggered by neck movements. Treatment is based on symptoms and may be combination of above treatment modalities. USA Data--Over half (52.7%) of the workforce surveyed reported having headache, back pain, arthritis, or other musculoskeletal pain in the past two weeks, and 12.7% of all workforce lost productive time in a two-week period due to pain. Why should you treat pain? Control of pain has been a relatively neglected area of healthcare, hence WHO in association with American Pain Society have included pain as the 5th vital sign and is now universally followed. Since2004, WHO in association with International Association for Study of Pain (IASP), World’s largest Pain organization, has dedicated third Monday of every October as “Global Day Against Pain”, which seeks to draw global attention to the urgent need for better pain relief for sufferers. Total annual incremental cost of health care due to pain ranges from $560 billion to $635 billion (in 2010 dollars) in the United States, which combines the medical costs of pain care and the economic costs related to disability days and lost wages and productivity. Research shows that 50-75% of patients die in moderate to severe pain. 1 in 6 Americans suffers from chronic pain. It affects at least 70 million people in the U.S., either from back pain, neck pain, joint pain, and headache. Back pain is the second leading cause of doctor visits and the third leading cause of hospitalization in the U.S. Chronic pain is a leading cause of lost productivity, ($70 billion) and increased health care ($100 billion), not to mention immense suffering. There are over 3000 pain physicians in USA and numbers are growing fast. However there are only few pain facilities and pain physicians in India in spite of huge population of patients who need specialized care. There is almost negligible cancer pain management. When pain lasts beyond healing or errant nerve impulses keep alerting the brain about tissue damage that no longer exists or that is out of proportion to the underlined cause, the pain (‘useless pain’) is no longer a function of a healthy nervous system and the chronic pain itself becomes a disease. Treating pain promptly can prevent it from turning into hard-to-treat chronic pain. Any pain which refuses to go away after medications for three to four months, needs intervention from pain specialists. Lower-back pain is the most common affliction, followed by headache / migraine, and neck pain. Between 50-70% of cancer patients have significant pain. India has some peculiarities, in addition to above. It has over 40 million diabetics and is called the diabetic capital of the world. Up to 60% of diabetics are likely to develop diabetic neuropathy, including painful peripheral neuropathy, requiring specialized pain management. Elderly- 5% of Indian population is 65 years or more and the numbers are growing. They are prone to musculoskeletal pain (Spinal pain, degenerative diseases), cancer, joint pain etc. Repeated Stress Injury (RSI), like back pain, neck pain, tennis elbow, carpal tunnel syndrome, due to bad ergonomics, stress and repetitive motion and is common in our young computer professionals. Pain Management is the scientific evaluation, accurate diagnosis of source / root cause of pain and instituting appropriate treatment by pain specialists. Earlier, when medications failed ,most patients suffering from chronic pain were recommended surgery, now they are managed by Pain Physicians. Interventional Pain management (IPM) uses minimally invasive techniques to reach the pain source and small amount of drug is sufficient to resolve the pathology, whereas orally taken medications do not reach the pain generators in sufficient amount and at the same time produce many systemic side effects.